Sand, Wind and Stars - LRDG, 70 years on: We can fix it. 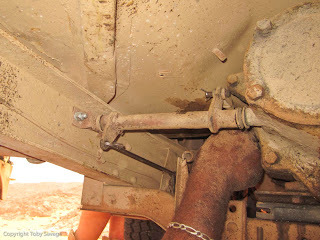 Those who fiddle with old cars and 4x4s will, I’m sure, be interested in the myriad improvised repairs we made to the Jeeps on this epic trip. As we rolled out of Alex on 8th April both Jeeps were running well and the long haul south was without incident. It was when we refuelled in Mut that problems started. 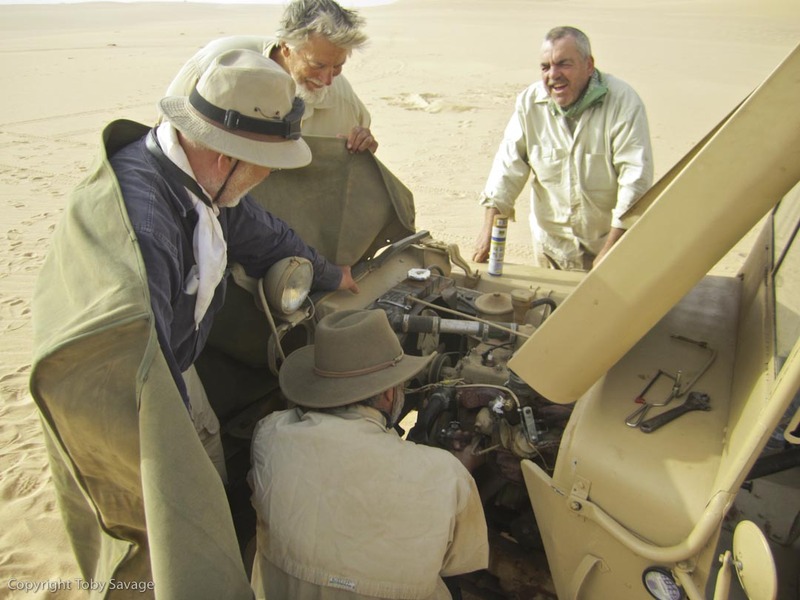 At this point I should say that we were very fortunate in having Rick Pewe on board and Egyptian Driver/Cook and Mechanic, Taraq. Between the two of them there was not much that could not be fixed. Rick identified that the tappets needed adjusting on the Willy’s and the in line fuel filter was dirty from the poor quality 80 octane fuel we filled up with. An hours work and some locally bought replacement filters had that complete. We then retarded the ignition by a few degrees to get both Jeeps running well on the lower octane fuel. The one mistake we made was not marking the original ignition point before making changes. This made it a big job of trial and error to re time the ignition again when we had good fuel. 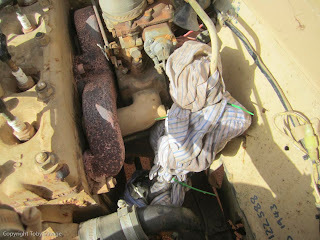 A length of fencing wire liberated somewhere along the main road from Alex was originally used to secure the radiator cowling which was rattling, but went on to become a replacement exhaust bracket on the Ford, number plate securing system, carburettor return spring anchor point and bonnet catch. The only breakage on the trip was a clutch tie rod between the pedal and the clutch cable. This looked serious, but Taraq soon modified an old bar-b-que fork to an almost exact replacement! In the Great Sand Sea we were cursed with a persistent strong wind - first from the south, then cooler from the north. Awful conditions to adjust the tappets on the Ford, but using both canvas tops as a wind break Rick had them done in an hour and we found more power to tackle the dunes. Each Jeep has a different method of pumping fuel from tank to carb. The Willy’s is electric now pumped through two inline filters which have now been replace three times. The Ford has an engine driven mechanical pump that overheats in the scorching temperature we have driven through. To cool the pump we used the same technique the locals use to keep drinks cool. We wrapped an old rag (my shirt) around it and soaking it in water. Fixed! Whilst deep into the dunes running fast on an inter dune corridor I noticed a new noise from the back of the Ford. It had clearly been dripping oil over a prolonged period from the input shaft seal and had run out - hence noisy bearings. We had the correct oil but getting it in required fabricating a special funnel from an old water bottle. It worked and within 15 minutes we were on our way. The final problems (we hope) were in Siwa where we somehow filled the Ford with petrol containing an unacceptable amount of water. This had even Rick baffled for a while as there was clearly fuel at the carb and a good spark, yet the engine refused to run. After much fiddling we decided to dump the whole tankful of fuel, clean the carb and start again. As I write this 100 km into the fast run up to Alex all seems well. Photos show adjusting the tappets in the Sand Sea, Rick fixing the exhaust bracket, the inprovised clutch rod and the cooling system for the mechanical fuel pump. It is a great testament to the Jeeps that they are so easy to fix. It may well be that modern vehicles are more reliable. 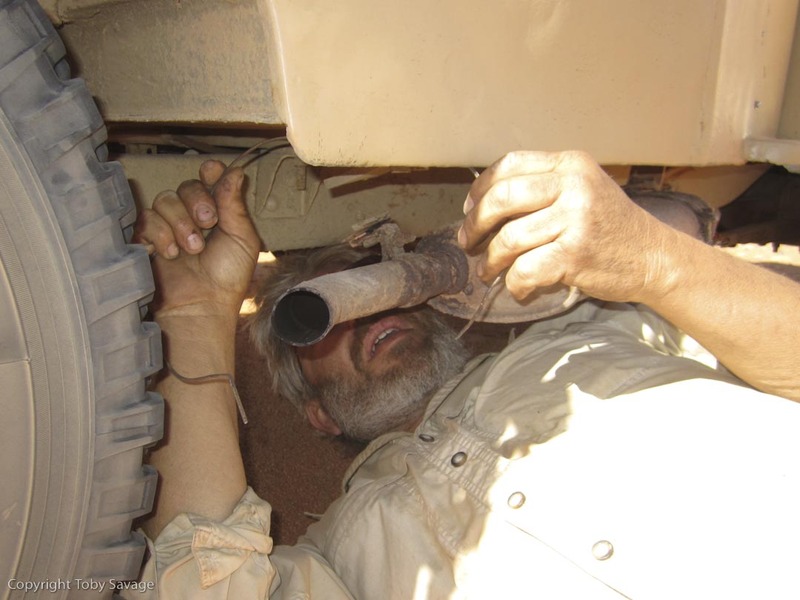 But the chances of being able to fix a 2008 LandRover's ECU in the desert with a length of fence-wire is negligible! I'm all for simplicity, me!